"SIR WALTER SCOTT, the star that beamed with such effulgence in the heavens of romance, has vanished from the gaze of mortals. The lovers of poetry and fiction are in deep mourning; and all the votaries of Waverly are clothed in sadness. The fall of a monarch, from the giddy heights of his ambition; or the demise of some mighty chief, who guided the destinies of nations, could not call forth such a display of sorrow, as the exit of this most accomplished story-teller. The genius, the admirable genius of the author of fifty tales of fashion, dwells upon the tongues of all the young Misses and Masters, who riot upon the delicious products of imagination. The veteran maids and the ruthless odd fellows, who frequent enchanted fields and castles, exclaim, that the immortal author of a hundred romantic visions has "paid the debt of nature," and that mortal eyes shall never see his like again. The critics and reviewers, the poetasters and novelists, the romancers and fabulists, are in bitterness because their model is no more--because this liberal purveyor for their amusement has left the world of shadows, and has mingled with the nations of the dead in the world of realities". Walter Scott was born in Edinburgh on 15 August 1771 ,a plaque at 8 Chambers St marks the approximate spot. His father, also called Walter, was a Writer to the Signet (solicitor); his mother Anne Rutherford was the daughter of a professor of medicine. At the age of 18 months his right leg was rendered permanently lame by polio, and as an infant he was sent to his grandfather's farm in the Borders. He would divide his time between Edinburgh and the Borders for the rest of his life. In 1775 the family moved to a more spacious house at 25 George Square, where Scott was to live until 1797. He was educated at home until October 1779, when he was enrolled at the High School of Edinburgh. He also attended Kelso Grammar School during stays in the Borders. He studied law at Edinburgh University from 1783, with interruptions because of his illness. He was indentured in his father's legal practice on 31 March 1786, but did not qualify as an advocate until 11 July 1792. Scott was to continue in his legal career until retiring in 1830. Scott's interest in traditional ballads was formed in childhood, and during his stays in the Borders he began collecting them. He was also interested in German literature, and his first publications were translations of ballads by Gottfried Augustus Burger (1796), and of Goethe's "Gotz von Berlichingen" (1799). He married Charlotte Carpenter on 24 December 1797, and their first homes were at 108 George St (lodgings), 10 South Castle St, and then 39 Castle St (a statuette of him can be seen above the door) which was to be their Edinburgh home from 1798 until March 1826. Scott was appointed Sheriff-Depute of Selkirkshire on 16 December 1799 and went to Ashestiel in the Borders. Here he completed the ballad collection "The Minstrelsy of the Scottish Border" with the assistance of John Leyden, Richard Heber, William Leidlaw and James Hogg. The first two volumes were printed by his Kelso friend James Ballantyne, and their success led Scott to lend Ballantyne £500 so that he could set up a printing works in Edinburgh. Scott became his partner and principal shareholder, and also backed the new publishing business of Ballantyne's brother John. Scott's first wholly original publication was the ballad epic "The Lay of the Last Minstrel" (1805), which was an immediate critical and financial success. He followed it with "Marmion" (1808) and the hugely popular "The Lady of the Lake" (1810). Aspiring to baronial country life, Scott began in 1811 to build himself a gothic castle, Abbotsford, near Galashiels, and it was partly to raise money for the project, and also so as to ensure his literary supremacy over Byron, that Scott turned to fiction. Another reason was a crisis in Ballantyne's business in 1813, which threatened Scott with bankruptcy. Scott wrote his way out of trouble with "Waverley" (1814), which defined a new literary genre and was to be followed by a stream of similar successes. Scott published all his novels anonymously. Initially this may have been a precaution against the possible failure of "Waverley"; but even after its enormous success, Scott seems to have enjoyed prolonging the mystery (he was nicknamed "The Great Unknown" and "The Wizard Of The North"). His identity as the author of "Waverley" and its successors soon became an open secret, fairly widely known, but it was not until February 1827 that he officially "revealed" himself, at a public dinner in Edinburgh. Though the novels were all published without his name (even after his "unmasking"), they were grouped into various series which associated them with a common author. Some were published as "By The Author of Waverley"; two appeared under the title "Tales From Benedictine Sources", another two as "Tales of the Crusaders", and four as "Chronicles of the Canongate". The remainder of Scott's novels were published under the heading "Tales of my Landlord", though there is no real connection between the various "Tales", other than the conceit (introduced in the prologue to "The Black Dwarf") that they were all written down by one Peter Pattison from stories told to him by the landlord of the Wallace Inn at Gandercleugh, then reworked and sold to the publisher by the village schoolmaster and parish clerk, Jedediah Cleishbotham. Scott's novels made him one of Europe's most famous literary figures, and he was created a baronet in 1818. In 1820 his daughter Sophia married John Gibson Lockhart, who was later to write a vast biography of him. In 1823, with Lord Henry Thomas Cockburn (1779-1854), Scott founded the Edinburgh Academy, a school for boys. But the financial disaster he had averted in 1813 finally hit him in January 1826, when Ballantyne's business failed and Scott was declared bankrupt. His wife died on 14 May. 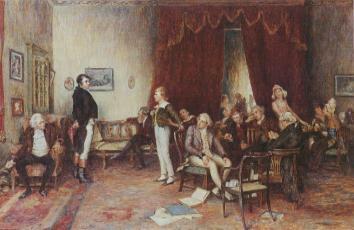 Resolving to settle his debts in the only way he knew, Scott announced (according to Lord Cockburn) that his "right hand shall work it all off", so that in his last years there could be no letting up of his prodigious output, which he had maintained while continuing to practise as an advovate. He retired from the court in 1830, by which time his health was failing. In 1831 he cruised the Mediterranean, then in July of the following year he returned to Scotland. He died at Abbotsford on 21 September 1832 and is buried at Dryburgh Abbey. Edinburgh's Scott Monument (1844), and the nearby Waverley Station, bear witness to his extraordinary status in Victorian Britain; it was Scott who largely defined Scotland's image in the last century, even including the clan tartans which he helped invent for the occasion of George IV's visit to Edinburgh in August 1822. Scott created and popularized historical novels in a series called the Waverley Novels. In his novels Scott arranged the plots and characters so the reader enters into the lives of both great and ordinary people caught up in violent, dramatic changes in history. Scott wrote frequently about the conflicts between different cultures. Ivanhoe (1791) deals with the struggle between Normans and Saxons, and the Talisman (1825) describes the conflict between Christians and Muslims. The novels dealing with Scottish history are probably Scott's best. They deal with clashes between new commercial English culture and an older Scottish culture. Many critics rank "Old Mortality" (1816), "The Heart of Midlothian" (1819), and "St Ronan's Well" (1824) as Scott's best novels. Other works in the Waverley series include "Rob Roy" (1817), "A Legend of Montrose" (1819), and "Quentin Dunward" (1823). From his forebears, from his childhood years, and from his many excursions on horseback into the valleys of Ettrick and Yarrow, Tweed and Teviot, and Liddesdale, Sir Walter was imbued with a deep love of the Border country. His tenancy of Ashiestiel was coming to a close; he therefore decided to become a Tweedside laird by purchasing in -1811 from Dr. Robert Douglas, parish minister of Galashiels, for 4000 guineas a farm on the right bank of the Tweed. It lay six miles down river from Ashiestiel and consisted of a haugh, called Newharthaugh, and a rough bank mainly covered with its native heath, a total of about 110 acres. The little farm house and steading was called Cartleyhole. Sir Walter and his family with the farmhands and domestic servants headed Tom Purdie, and all their livestock and dog flitted to their new home on May 28th, 1812. As the land had once belonged to the monks of Melrose and a ford just below the house had been used by the monks, he decided to change the name to Abbotsford. When they moved in Sir Walter already had plans for enlarging the house, but these were not carried out until 1818. The additional building connected the farm house to the steading and consisted on the ground floor of an armoury, dining-room, study and conservatory, and on the first floor of three bedrooms. There was a tower on the western corner. Before leaving Ashiestiel Sir Walter had completed The Lay of the Last Minstrel, Marmion, and The Lady of the Lake; but it was not until he moved to Abbotsford that he began the series of Waverley Novels, commencing with Waverley in 1814. From the success of his writings there grew a hunger for more land and a desire to increase the size of Abbotsford. Early in 1822 the old farm house was entirely pulled down and in its place the present main block of Abbotsford was built. Sir Walter and his family were able to occupy the new portion of the house by the autumn of 1824. The architect responsible for the plans of Abbotsford was William Atkinson, although Sir Walter himself and his friends, Daniel Terry, Edward Blore and James Skene of Rubislaw, had many suggestions to make. George Bullock of London also gave useful advice as to the furnishings. The builders of Abbotsford were Sanderson and Paterson of Galashiels (first portion) and John and Thomas Smith of Damick (second portion, which included the gateway and court walls). John Smith was no mean sculptor as well as a master builder. 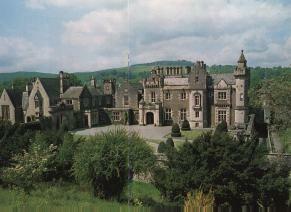 By 1820 Sir Walter had extended the estate to some 1400 acres, including the lands of Mr. Usher of Toftfield. John Smith built a new cottage on Harlawburn for the Lockharts which Sir Walter called Chiefswood. One of the houses at Toftfield Sir Walter renamed Huntlyburn and installed there his great friend, Adam Ferguson, and his sisters, as tenants. Sir Walter was a great planter of trees, and he was one of the first to make his own oil gas for lighting purposes (1823). After the death early in 1853 of his brother-in-law, Walter Lockhart Scott, Mr. Hope-Scott made many improvements to the house and grounds and to the estate. He added a west wing to the house which included a chapel, kitchen and domestic offices; and he built an entrance lodge. There was a great deal of unemployment in Galashiels at that time and he gave work to a large number of men who helped in the construction of the present terraces and of a bank which screened the house from the main road. He feued from the Scotts of Gala about half a mile of bank on the opposite side of the Tweed and planted trees along it; and he made fresh access to the house from the main road for tourists. Many interesting people came to stay at Abbotsford as guests of Sir Walter. 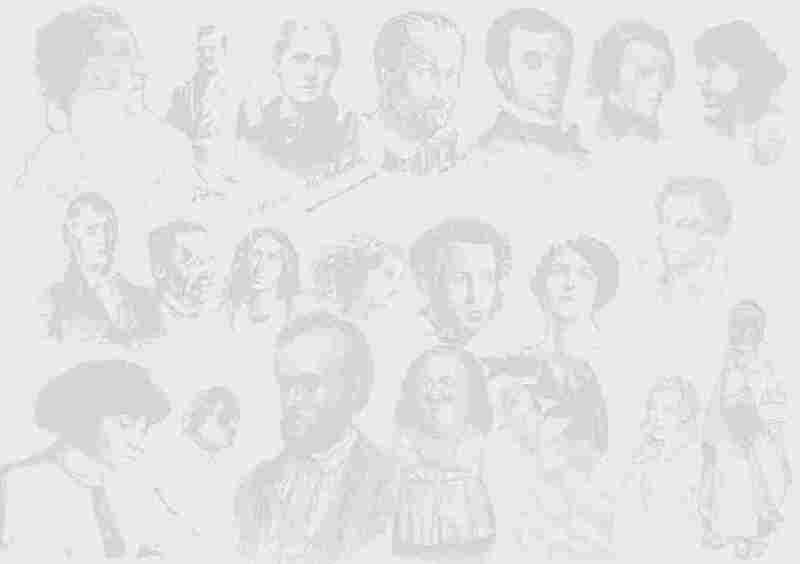 Amongst them were Maria Edgeworth, Wordsworth, Thomas Moore and Washington Irving. After Sir Walter's death in 1832, tourists came to Abbotsford in increasing numbers year by year. In 1883 about 1500 came, including 20 from the United States. Queen Victoria came to Abbotsford on 22nd Augusts 1867, and had tea with the family. King George V and Queen Mary, and the Duke and Duchess of York (later King George VI and Queen Elizabeth) visited Abbotsford on 12th July, 1923. The Duke and Duchess of Gloucester visited Abbotsford on 26th August,1964. Scots hold four men high in the glory of their country's story - Wallace and Bruce, Burns and Scott. Wallace and Bruce forged the independent nation, Scotland. Burns and Scott gave that nation an assured place in world literature. Carlyle, another great Scottish writer, said of Sir Walter: 'No Scotchman of his time was more entirely Scottish than Walter Scott.' Indeed if ever a nation found expression in one man, it was in the case of Scotland and Scott. Till his time the Highlanders and the Lowlanders of Scotland looked on each other with distrust and dislike. It was Scott who changed all this. It was Scott who made them both sons of Scotland. It was Scott who made all Soots proud of their language, whether Gaelic or Broad Scots, of their country and of themselves. Then came the Peninsular War against Napoleon in the first decade of the nineteenth century. The Highland Clansmen charged on the battlefields along with the warriors from the Lothians and the west, Tweeddale and the east. Now instead of Lowlanders, Borderers or Highlanders, all whether MacDonalds, Camerons, Frasers, Stewarts, Carruths, Burns or Scotts called themselves simply Scots. All this is due in the main to Sir Walter Scott. High honour indeed. So we now take our leave of the great Scott, who makes one humbly grateful to be a Scot. During the late eighteenth and early nineteenth centuries, natural historical theories characterized what is innately human as the faculty for language and the potential for "perfectibility." Humanity came to be characterized through performative acts, yet the species itself was regarded as biologically static. Humanity can only change (let alone become perfect) through language and culture, not biologically. This emphasis on language and culture as a distinguishing characteristic of the human species inordinately emphasized the linguistic aspects of what it is to be human. As a result, human variation (ethnicity, race, and behavior) came to be seen as essentially a function of language and environment. While environmental factors might alter a people, essentially and universally all people were thought to be biologically similar, although linguistically and culturally distinct. Thus, the Scottish Highlanders came to be seen (and saw themselves) as a race distinguished from the general population of Great Britain through the existence of their language and culture and the location in which they lived. The threat posed to the Scottish Highlanders by the encroaching English language and culture, and the corresponding view of history as progress put forward by philosophers such as Adam Ferguson and Adam Smith, maintained that Highland culture would inevitably "progress" towards the more advanced English culture. The uniquely "Scottish" elements of the language and culture would die out and if the Highlanders lost their language or were driven off their land, then they would lose what made them Highlanders. Scott's early career reflects this ethnographic concern for the language and culture of a "doomed" race in the increasingly anglicized Scottish Highlands. Highland culture could not resist the inevitable march of historical progress, yet its language and culture could be translated and transformed into print to preserve it, as Minstrelsy of the Scottish Borders and Lay of the Last Minstrel demonstrate. However, this emphasis on linguistic difference and attempts at linguistic historical research and the recreation of ethnic, racial and human origins eventually lead to linguistic difference taking on a taxonomic importance. Borrowing comparative anatomy, physiognomy, and phrenology from natural historians such as Cuvier and Lamarck and Lawrence, the physical and cultural characteristics of the different races began to be classified, compared and studied as biologically determined, resulting in an increased emphasis on the body as the sole source of racial, ethnic, and behavioral variation and giving birth to the fictions of national character and racial "blood." 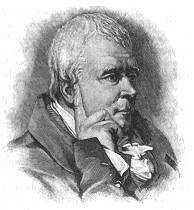 Sir Walter Scotts literary efforts still reflected his earlier attempts at linguistic preservation; however, he also began to implicitly evoke these natural historical theories in his fiction. Scott emphasized in his historical novels Waverley and Ivanhoe a message of cultural and "racial" hybridity as a means of politically preserving the nation of Great Britain. Scott amalgamated the better characteristics of the different "racial groups" comprising the British Isles (Highland-Lowland-English and Norman-Saxon) into cultural and racial hybrids. These hybrid heroes take the best of both the primitive-colonized and colonizing-English cultures and offer a solution to the "Scottish problem." As Georges-Louis Lecerc, Comte de Buffon postulated in A Natural History, General and Particular (17981808). "Preliminary Discourse" in Researches on the Bones of Fossil Vertebrates (1812), Philosophie Zoologique (1809), and Lectures on the Natural History of Man (1819), respectively. Ó a.r.e.a/ Dr. Vicente Forés López.